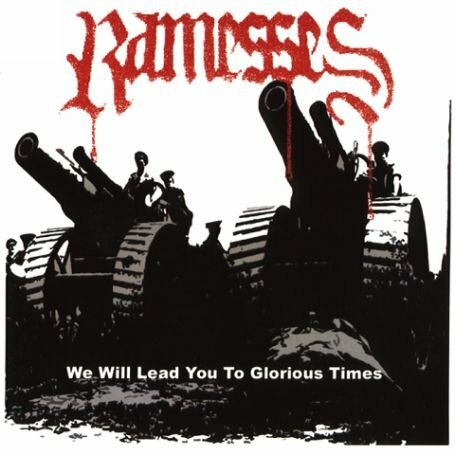 The Album Of The Week is "We Will Lead You to Glorious Times" by Ramesses. "When Tim Bagshaw and Mark Greening abandoned ship a couple years ago and went on to form Ramesses, it looked like the doom giant Electric Wizard was, well, doomed. Electric Wizard did of course manage to put together a new line up and release last year’s strong effort, We Live, and now Ramesses has followed suit. So rather than lamenting what looked to be an end of one band, doom fans can enjoy the reincarnation of that band and the genesis of a new one. Bagshaw has discarded the bass in favor of the guitar (his original instrument), and recruited Adam Richardson (ex-Spirmyard) as a bassist and vocalist. Three of the four tracks on We Will Lead You To Glorious Times have appeared in various combinations on prior demos and a split with Negative Reaction, but this debut combines them to give listeners a solid thirty minutes of material to soak in the acrid doom of Ramesses. Ramesses’ brand of doom has a somewhat different texture than many. Their raw grittiness feels less like THC induced fuzz, and more like a murky, organic spinning cloud of bitterness. Richardson’s vocals compliment the music well, typically consisting of rumbling guttural yells, but also making use of more melodic singing in a few passages. There are of course the requisite monolithic riffs that hypnotize with a dark spaciness, but Bagshaw often overlays accents of more mobile melodies, as heard on “Master Your Demons”, which gives the song a nearly southern groove in sections. “Witchhampton” is the new song of the bunch, and it kicks off the album well with nine minutes of spacey riffing and rumbling, vitriolic doom. As usual, Mark Greening is all over the drum kit, providing a pummeling drive while finding room for plenty of interesting fills. He is in particularly fine form on “Ramesses II”, a song titled after the Egyptian ruler for whom the band is named. The centerpiece of the album however, is the eleven minute “Black Domina”. The track has by far the most range of the bunch, making good use of head bobbing, smoky riffing, caustic vocals, and long stretches of instrumental sections. The band noodles on riffs during quieter parts of the song, only to lull the listener before crashing headlong into a heavy section that includes impassioned clean bellows from Richardson. It’s a great crescendo, and it is a trick that manages to turn a simply long song into an epic one. "We Will Lead You to Glorious Times is four songs (plus two videos) of impressive doomage. Sure, the closest reference point sound-wise will always be Electric Wizard, but there’s enough of an identity to bring Ramesses out from the shadow of Greening and Bagshaw’s old band. There’s less of the psychedelic noodling, for one. The songs are more direct, more heavy hitting. And Richardson’s vocals are gruffer, veering towards a death metal growl. If he had stuck with just that style, the overall effect would be lessened, but he’s also able to belt out when needed. With We Will Lead You to Glorious Times, Ramesses have carved their own niche in the world of doom. Recommended for fans of Electric Wizard, Ufomammut, and the like."